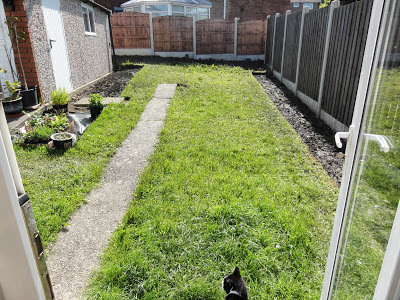 It's been a couple of months since I last blogged about the new garden. I've not been that well so when I do feel ok, I tend to focus on actual gardening, rather than blogging. Things have come on since we got out the leylandii early April. 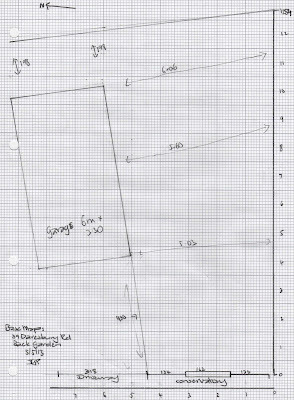 The first thing I did was draw up a base map, including the measurements and plotting key items, such as fences, the garage etc. 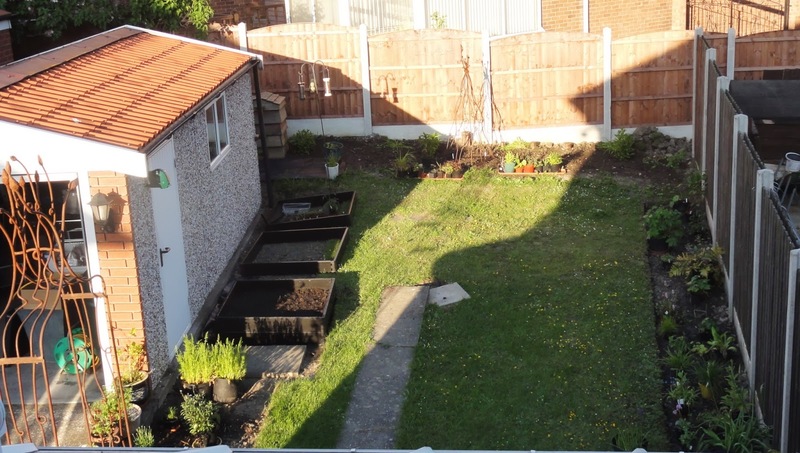 Because this garden is largely a blank slate, this was fairly straight-forward. I didn't include the washing line on the map, as I planned on taking that out, so it isn't a permanent feature. So in a short few weeks, already the way the light falls over the garden has changed. By taking time to survey the site, take photos over time, I can get an idea of what part of the garden gets most sun, at what times of the year. And this led me to a conundrum. It clearly makes sense to survey your site over time before you jump in and start designing and digging. If I made the mistake of just using where the shadows fell in late spring-early summer, I could mistakenly plan beds for plants that need full sun in the wrong place. The mid-April photo above shows that quite a bit of the garden is in shadow around 4:40pm. 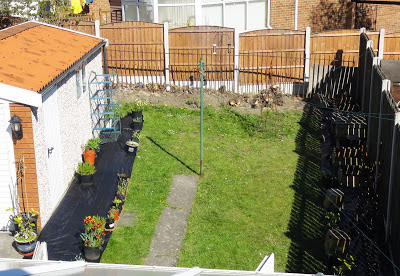 If I used the early May photo only as the example of where the shade falls, I could make a mistake of assuming more of the garden gets light for a longer period of the year than it does. The shade from the fence in the middle of the year at the same time of day is half again of what it is in the May photo above. However, I really wanted to get planting and growing. I desperately wanted to get planting and growing. I mean, what is a gardener if she doesn't have any beds to plant in?! The conclusion I reached has given me both the sensible permaculture option, and the chance to start planting. 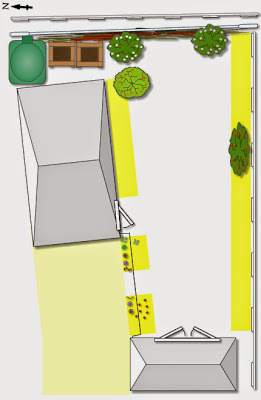 Here is the initial outline of the garden design. What won't change over the year, is the fact that the left-side border, next to the driveway and garage, will get full-sun most of the day (at least 6 hours) all year around. And the right-side border will largely be in shade most of the year around. I'm calling this, rather originally (! ), the Shady Border. The part of the Shady Border near the conservatory (bottom of the picture above) will get early morning sun for a 2-3 hours depending on the time of the year. However the other end of the Shady Border will be in shade most of the year, except for about 1 hour in the morning between May and July. 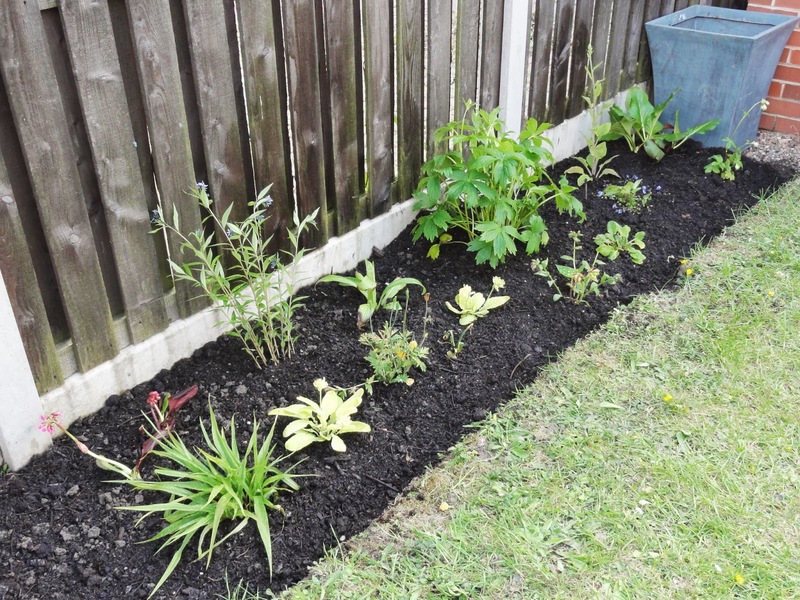 I can use the Shady Border to plant lots of lovely perennials that like different levels of shade (full shade to part-shade). The 'tree' picture in the middle of the border is where the Morello Cherry will be planted in Autumn. So, based on the known facts of the left and right side borders, I can make some initial design decisions. I can meet my desperate desire to start planting by starting on the Shady Border, and continue to survey the rest of the site over the coming months before making any further decisions. This also allows me to spread out the cost of initial work. 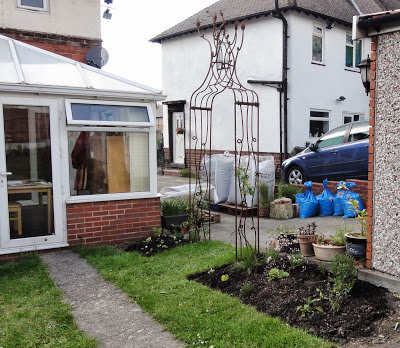 I got in a gardener to help do some initial clearing and digging of the beds. I'd picked up quite a few plants for the Shady Border from Hardy Plant Society plant sale at the beginning of May, plus more from a visit to Beth Chatto's garden mid-May. I ordered in a lot of compost, as the ground is quite heavy clay, and voila, my first border is starting to grow. Omphalodes cappadocica 'Cherry Ingram' . Next to the drive way I have placed my arch, and created two smaller beds, the Strawberry Border and the Herb Border (names I believe are self-explanatory). Growing up the arch from the Strawberry Border is Clematis x triternata 'Rubromarginata', and from the Herb Border is Rosa 'Seagull'. please ignore the ugliness of the driveway at this time! When digging these borders, I discovered some electrical cables that led from the house to the garage. It shows again why it takes time to get to know your site. We had wondered where the cables were, but only found them when I nearly put a fork through them. Should have looked more carefully! I've added them onto the plan as I don't want to forget they are there. At the top end of the garden where the leylandii used to be, I think will get at least 6 hours of sun all year around as well. 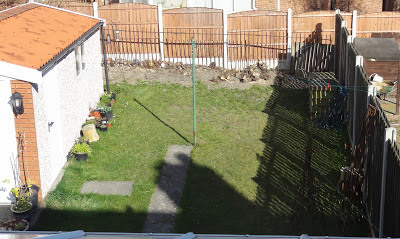 At the moment I'm thinking of putting in Damson, Quince and Greengage trees, but need to continue to think on how I will design this area, including how to deal with the fence (initial thinking is pergola with grapevines), as I need to get a better idea of the light, effects of the neighbours fence, etc before I decide for sure. The two brown boxes (on the design further above) are my 'beehive' compost bins, and the green box is where the large water tank will be going. 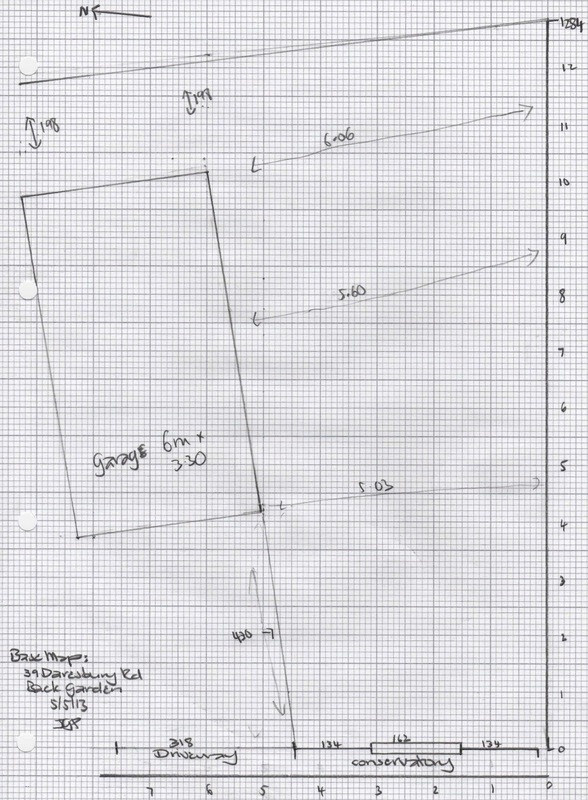 Alongside the garage will be three raised beds for vegetable growing, with the 1st bed ready for planting. I'm using link-a-bords for these. They are simple to assemble, made from recycled plastic, and require NO maintenance, the latter a big plus in my view. Not as attractive as railway sleepers I admit, but they would take up a lot more space and mean less room for actual growing, which is more important. I've put in a tomato plant and have some coriander and basil to plant out, and will sow more seeds over the coming weeks. Finally, I feel like I'm a gardener again. Yes, I have a long way to go. More surveying, thinking, designing and doing. I need to think around how best to deal with the driveway, which gets a large amount of sun and we don't use for a car, maybe large planters? But for now, I'm very satisfied with the initial outline. And I think I'm managing to meet both permaculture principles as well as deep emotional growing needs. 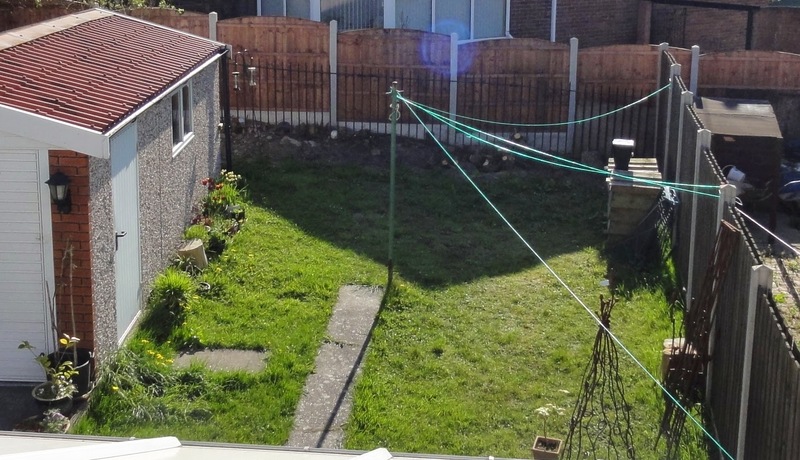 Nice to see your new garden taking shape. An exciting time. Nice calculations and considerations. building any thing considers many things, here it can be seen from the example, building a garden considers many things, shadowing from fencing, house, its entire architecture. A great representation.